The galvanized spiral duct is mainly plated with zinc on the iron sheet of the wind pipe to protect the iron sheet. Zinc coating is passivated, dyed or coated with light retaining agent, which can significantly improve its protective and decorative properties. The spiral duct market is generally divided into three types according to the material: galvanized spiral duct, stainless steel spiral duct and composite spiral duct. Among them, the stainless steel air duct has the best quality and applicability, but the price is high. At present, the most widely circulated spiral pipes in the market are galvanized sheets. 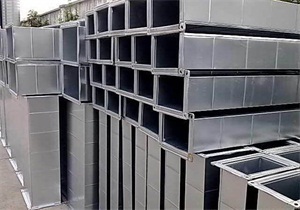 Galvanized sheet spiral ducts are basically stainless steel spiral ducts, but the price is only two-thirds or even lower than stainless steel ducts. Composite spiral air duct is commonly used in places where the external environment is more common and the requirements for wind pipes are not too high. The spiral duct is widely applied. Purification system return air duct, central air conditioning ventilation duct, industrial air supply and exhaust ventilation duct, environmental protection system suction and exhaust duct, mine gas drainage pipe, mine coating duct, etc. There are three ways to clean the most effective wind pipes. 1. vacuum suction: operated by a vacuum suction pipe similar to a handheld type. Use brush to directly contact the inner wall of the pipe to remove dirt. This method requires the duct to have a large overhaul hole so that the operator can get as much as possible, but this method is most likely to leave out a part of the dust and dirt, because the duct can not form a complete negative pressure conditions. The following methods can form negative pressure conditions. 2. Power scrubbing: brush dirt with a pneumatic or electric brush, and then the dirt is sucked into the vacuum collector in the same way and direction as the gas scrubbing. This method requires caution as far as possible, so as not to damage the appearance of thermal insulation materials. 3. gas flushing: this method uses the hose connected to the air duct with nozzle to transport compressed air. The design of the nozzles allows compressed air to drive dust and dirt into it. The dirt and dust dried by compressed air are transported to the vacuum collection container along the duct. This article is published by Jinan exhaust hood, do you know something about these contents? For more information, please click: http://www.jnqsg.com, we will have more exciting content for you to see.